The forecast said there was a 50 percent chance of rain and it was pouring during the entire drive to Liberty Lake. And it continued to soak the course. 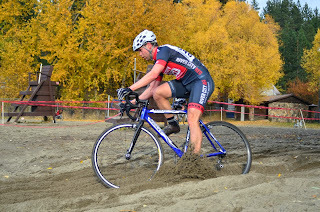 I had intended to do the single speed and men's masters 50+ but then I realized I did not have enough dry clothing if I was going to be out in the rain for two races and taking pictures in between and after. So I bagged the first race. The rain stopped about halfway through the race. 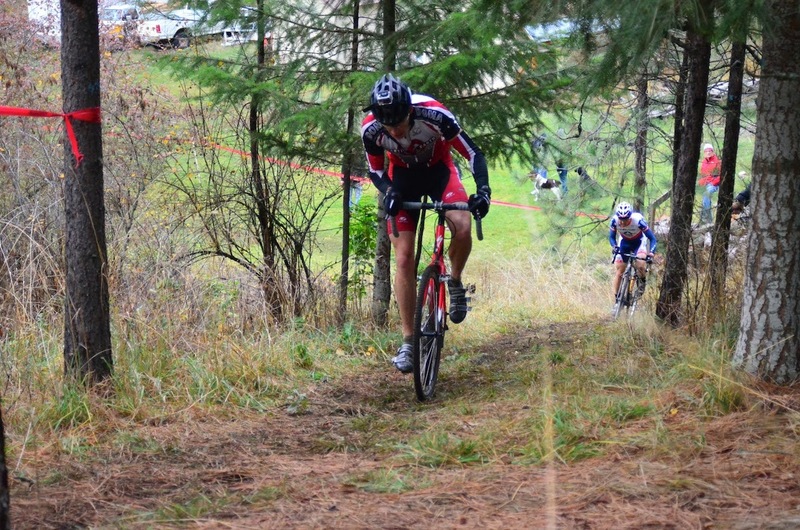 Liberty Lake is a challenging course, mostly because it's 90 percent uphill. Well, it seems like it. The start is a long gravel road that makes a sharp right (in gravel) into a campground where there's another sharp right (in gravel). Take that too wide and you get really close to one of those barbecue grills on a stand. Don't ask me how I know. After that we had some back-and-forth with 180-degree turns on wet grass that each race churned up and made boggier. (Is that a word?) A long straightaway followed with a turn just after the barriers and then we had some twisting and turning through the trees. Coming out of that we made a beeline for the beach. This year the markers were set about three feet away from the water's edge so we weren't forced into the water. The sand was loose and quite a few people lost it on the first turn. The trip back is a long steady incline to the finish. 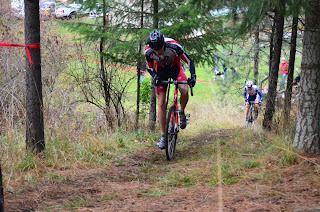 The part right after the finish is steeper but the funny thing about it is that it doesn't look like it. But once you hit it you're gearing down. Okay, so I was. A little more twisting and turning and then you're climbing to get to the run up. For your reward you are treated to a long run up. After that you swoop down back onto the road and keep going until your time is up. I was happy with my race. I stayed upright and I didn't get hurt. Two plusses right there. I reeled in a couple of racers, battled with them, and won each time. I passed the first guy on the run up. Then at the top I was greeted by Doug Newell offering a Dixie cup of beer. What the heck, you only live once, right? I grabbed it, jumped back on the bike, downed the beer, and rolled on. I had one each lap and I was surprised it didn't seem to affect me in a bad way. The next guy I passed was on the first turn in the sand. I went way wide on the grass, got by him, and tracked a deep groove on the turn. Then I ran away from him on the climb back. I caught the third guy just after all the gravel. Coming out of the back-and-forths and onto the straightaway towards the barriers, I put it on the big chain ring and cranked it. That guy chased me the rest of the race. 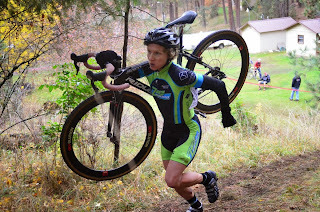 He didn't catch me but he did make up some time when I tried to remount after the barriers and slightly racked myself. Outside of that one mishap my barriers were smooth. 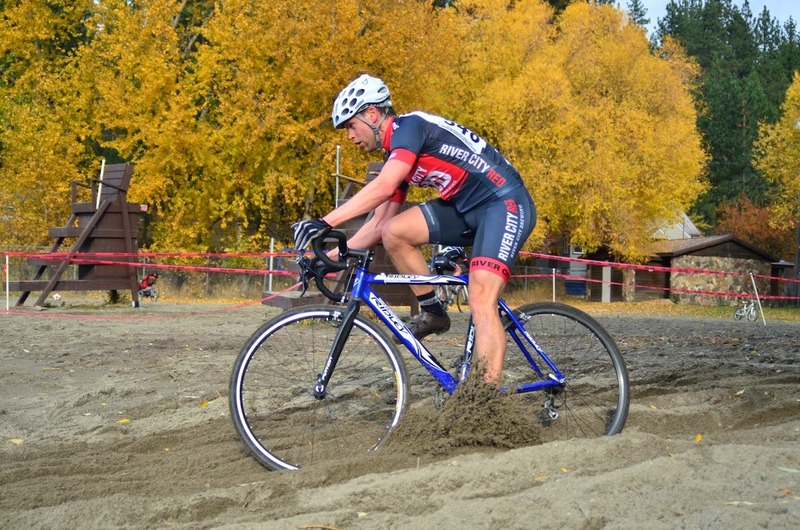 I rode through the sand each lap. The run ups went great. I shouldered the bike each time. And the PBR at the top was a welcome treat. I had a good, fun race. Jayne is an absolute fireball on the run up. This dude rode the run up every damn time. 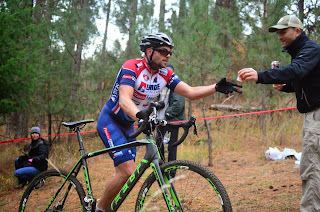 Nigel accepts a beer from Doug on his last lap. Boatloads of photos are posted on the INWCXS Facebook page.